I was having coffee this week with one of my coffee place friends and he shared a great story with me. He was in college at Vanderbilt and played on the basketball team; and in fact, was a very good college player. One day he was walking to class when he felt a tug, more like a grab, on his shoulder. Someone then spun him around and said to him,”If you would learn how to go to your left more you would score more.” The party said nothing more to him and quickly went on their way. Much to his surprise the party making the evaluation of his basketball skills was a coed who also attended Vanderbilt. I think one would have to say that was a pretty clever line. Was it truly a player evaluation, or “Hey, I’ve noticed who you are” statement? Well, evidently we both had some creditability, the coed who gave some basketball advise; and me, with my, “May I take your order” line. My coffee drinking friend and his coed wife have been married for thirty plus years. And for me, tonight and “The one who was driving,” are going to a show and dinner to celebrate our forty-ninth wedding anniversary. What’s the greatest pick-up line you’ve ever heard, or used yourself? Come on…don’t be so vain. When I was a little bitty boy growing up in Indiana, I used to go to church with my grandmother on occasion. It was a little old country church right at the edge of the little hamlet just a couple miles from where she lived. Typical country church for its time; cars pulled up on the front yard and no air-conditioning. In the summer time there were screens in the windows and fans. Hand fans were given from Woods Funeral Home with their advertisement on the back of the fans, remember? It was a well maintained clapboard painted white church building. It had two doors in the front. It was said at one time the men entered the church through the doors on the right and women through the doors on the left. On the last verse (and you sang all four verses – five if the song had five) of the “invitation” song Luther Squires came forward saying he wanted to be baptized. Now ole Luther was one of the wildest characters to ever live in them parts. He stole more chickens, goats, hogs, played more poker, quit more women, married more women, and drank more liquor than any fella to have ever lived in that county. Well, that’s what they said. You know, sometimes the only things you learn about others is the gossip of kin folks. It was said Luther had cut a wide path, or as some would say, cut a wide swath in his time. He was the best definition for the word trifling that one would ever hear. Look that word up in your Webster’s. Well, everyone (most everyone – never in a church is everyone happy about everything) was so happy on this Sunday morning that Luther had made such a decision. He was gonna get saved! 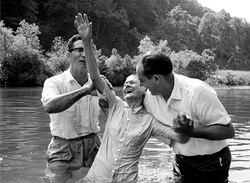 The preacher, Brother Hickman, told him, “We’re goin’ down to the creek to do the baptizing and I’m gonna immerse you in the creek.” When they got down to the creek, the creek banks are lined with folks. Seems word had circulated of Luther’s decision and a crowd twice the size of the morning’s gathering is now there for this momentous occasion. The preacher led Luther out into the creek. The water was about waist high and out of one of Luther’s pockets floats the ace of clubs. They take another step and from another of Luther’s pockets comes the ace of diamonds. Another step and out floats the ace of hearts. As brother Hickman turns Luther to face the good folks watching from the bank, yep, out floats the ace of spades. Hey, you can’t make this stuff up! You think I’d told a story to you? That’s the way it happened one Sunday back in my childhood. This Friday July 25th is our wedding anniversary. Forty-nine years, we were married in Terre Haute, Indiana on July 25, 1965. Below is something I wrote in 2009. As our anniversary nears I am reminded of this older gentleman I met early one morning on my way to play golf. The memory of him and what he shared with me has stayed with me. I remember he told me he and Mary had been married fifty-five years and he was still seeing about her. It’s been said, “Better to see a lesson than to tell one.” For some reason, on that particular morning, I did not stop at my usual coffee place. 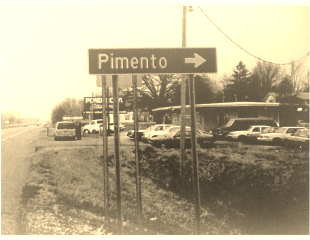 That day, I headed in the opposite direction- south on Highway 65. Shortly after that, he finished his coffee and cigarette. “Larry, spect I best be goin, bout time they will be gettin her up.” As he got up, he reached for my hand and shook it hard, told me it had been nice talking to me then said, “You have a good time playin that golf.” I watched him slowly make his way to his pick-up truck- old, beat up looking thing, maybe an early 70s model Ford. I noticed in the seat of the truck a dog was waiting for him. As he drove off, I thought, there are folks out there everyday who are fighting some tough battles and me, I’m blessed. I think I may have just seen one of the best definitions of the word “love,” I had ever seen. The rest of the day I couldn’t get Thurman and Mary off my mind. That afternoon on the way home from playing golf, (twenty-seven holes), I stopped and bought my wife a dozen red roses. She still remembers who I am. During the early 1960s’ folk music had a fling at popularity. The Kingston Trio were big. Below is something I wrote two years ago, June of 2012 group Peter, Paul and Mary. Mary has since passed away but I remember that evening and have never forgotten this song. It has a lot of different meanings for different people. I describe mine in this writings. Forty-one years ago I stood right next to her as she waited to go on stage. As I was waiting in the wings with her, I never thought that forty-one years later the lyrics to her (their) biggest hit would carry such an emotional blow for me. 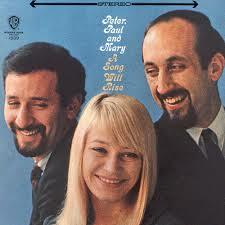 I am speaking of Mary Travers, of Peter, Paul and Mary fame. As one ages, or at least for me, there are occasions when I would like to freeze time, and today was one of those times. I have referenced in many of my previous ramblings about taking our grandkids to my coffee place. All six of them are well acquainted with what the smaller ones call the cookie place. Today my wife began her day like most Sundays; up, hustle around and off to church. We grab a bite to eat afterwards and then on with the afternoon activities. This afternoon saw me taking our six year old granddaughter, Delaney, and her four year old brother, Jake, for cookies and juice. children’s songs and I’ll put it on and we all join in; Old MacDonald and all the farm animals, etc. Paper, are buddies. It says that Jackie loved this rascal Puff. Further lyrics describe how they have good and special times together, kings paid attention to them, and pirate ships would lower their flags when coming into their presences. Pretty heavy credentials one might say. But the last verse says that “one night it happened.” Jackie came no more, he was gone, and it had a devastating effect on Puff. He quit roaring and he bowed his head in sorrow, his scales fell like rain, Puff would no longer play or be happy. It got so bad that ole Puff just went off into a cave and was never heard or seen again. brings something to the lives of all of us like nothing else. I know the thought of them never growing up is selfish on my part, but today, just today I wish Puff and Little Jackie Paper were together again. Dragons live forever, but not little boys and girls. I don’t know Kierstyn Mineker from a load of coal. I have never met her, would not know her if I saw her. I would not recognize her if someone placed an 8×10 glossy of her in front of me. If she was in a line-up of some type, I could not identify her. If there was a full size figure cut-out of her in our living room I would not know it was her. Little side bar here… Hey, I do have a full blown cut-out figure of Elvis in my office, given to me by one of my grand kids. The kid has such great taste. (Probably knows how to work his Poppop). Back to Kierstyn, I don’t know her, but I like her. Now, some background. This past week my wife and I booked an eight day Eastern Caribbean cruise for this coming February. Let me tell you the clincher for me and why I jumped at the opportunity to sail the high seas. Well, it is an eight day cruise with nine or ten of the old rock n’ roll acts from the late 1950s. Officially, I think they call it Rockin’ the Caribbean. Every day and night it’s music with the oldies; doesn’t sound much better than that to me. I almost booked the thing without first consulting with my wife; I said almost. Hey, forty-nine years of marriage have honed my “Let’s get a second opinion” skills. So this coming February we will sail the high seas and go rockin’ and rollin’. Personally they could take that ship, drop anchor in the middle of the ocean and let the music begin. Who cares where it sails. For that matter, I would not care if it ever left the dock, just bring out the old timers and let’s get on with the music. Now why do I like Kierstyn? Kierstyn was the young lady I called to book this cruise and have talked with since. When Kierstyn first answered her phone she didn’t answer like some lady whose socks must be tight. She was pleasant, professional, and answered my questions without continuous sighs of disgust. When I left messages on her voice mail, guess what? She called me back; really she did. Unbelievable, you call a business today and leave a message, good luck if you ever hear from them. She even sent me an email telling me she was out of her office but would call me the following morning. Bingo, she did. Last but not least, today in the Uncle Sam mail we got a thank you note from her saying she appreciates our business and wanted to know if she could help us with any future needs. Yes really, handwritten on paper. Not a text, but in human hand writing. I about passed out. I may even write ole Kierstyn and ask her to send my wife and I a picture. Hey, maybe even a full size cut out and I’ll place it right next to my man Elvis. I will give Kierstyn a further plug, she works for AAA Travel. I have said a lot of this in a nonsensical way, but today it is something rare when you experience service given in a competent manner. There was a time when good customer service was a given, now it appears a gift! Two years ago this month the following happened to me and I wrote about it. I now try to be less judgmental in similar matters that I often now see. I wonder why in so many matters we feel that we have to have all questions answered and if not, we do not become involved? My wife and I were driving home from Gonzales, Louisiana. We had been there for a week-end to an old car and rock- n- roll show. Then spent three days in New Orleans. By the way, if you want to have some fun spend a week end with seven thousand Cajun folks. Oh my, I love those folks. Around noon we stopped at a fast food place in Meridian, Mississippi to grab a bite to eat and then be back on our way home. We had received our order and before eating, I went to the rest room. In doing so I walked by this man whose eyes told his story. I had seen that look before on occasion. He was sitting alone, and you can put your own by-lines to the story. I had taken about two bites into my sandwich when I looked over at his table and noticed the only thing he had in front of him was a glass of water. I got up and walked over to his table. His head was bent down, and as I spoke to him slowly he began to bring his eyes up. “Are you hungry,” I asked him. “Uh, yes sir, I am.” I then told him to come and get in line with me and order whatever he wanted. I told him my name was Larry and I asked him his. He told me his name was Kenneth and from there we began our conversation. Some might ask “Was he lying to you?” Was Kenneth being truthful with me or was he just feeding me a line? Who knows how much honesty was in our conversation; but I will tell you something I’d bet my life on. He was drop dead, Abraham Lincoln honest with me about one thing… he was hungry. You know when you think about it, wasn’t that the question I had first asked him? “Are you hungry?” He answered my question very truthfully. No doubt about it, he was hungry and he was honest with me about that. Enough said. Near the end of this month my wife and I will have our 49th wedding anniversary. Even after all these years I still could use some wisdom and advice. I would’ve liked to have asked Mr. Lincoln how he would have handled the following situation I wrote about almost three years ago. It has been said that there is more written on President Lincoln than any other person in American history. I don’t know if that is true or not, but go walk the shelves of most any library, and you will realize that much has certainly been written regarding Lincoln. I wonder if he and Mrs. Lincoln ever attended a marriage seminar. 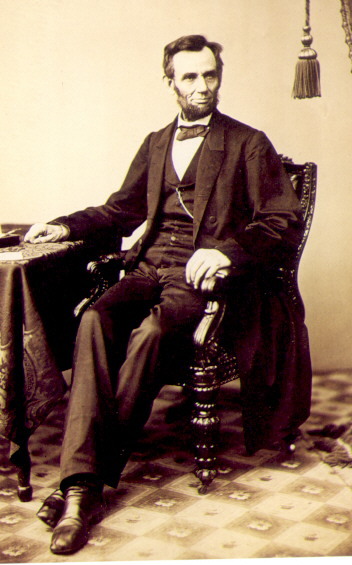 While at a political gala ball, a lady approached Lincoln and asked him, “How old do you think I am?” “That’s a pretty difficult question you have asked me” was his reply. Putting a hand to his beard, he thought for a moment and then said, “Why, I don’t know whether to guess you are ten years older because of the wisdom I hear you possess, or ten years younger because of the beauty I see.” Well, now, ole Abe handled that one with a lot of wisdom. This past weekend, my wife and I attended a two-day marriage enrichment seminar. After nearly forty-seven years of marriage, I am sure there are areas that could use a touch-up on my part. Marriage is like a lot of other things in life: it’s a journey never “with a complete arrival.” But with all of Mr. Lincoln’s wisdom, I’ve got a marriage question for him. Yes, I do. Sure would like to see him wiggle out of this one. Let’s set up this little scenario, Mr. Lincoln. This is a situation I recently encountered. Just imagine you and the little Mrs. are getting ready to go out for the evening, maybe to a movie, dinner with friends, the theater (oops, sorry, could be bad planning for you.). While getting yourself all fancy and fixed up, your wife is standing in front of that full-length mirror. She’s twisting and turning more than Chubby Checker doing his thing on American Bandstand. She tosses her head to the side and says to you, “Tell me, does this dress make me look fat?” OK, OK, now think and you best go really slow, choose your words carefully. You say, “Uh uh, oh no, honey. You really look good in that dress.” Uh oh, you answered too fast. “I know you’re just saying that to make me feel good” she says. Now it is your move. What do you say now Mr. Lincoln? You answered the lady’s question about her age very wisely, and she went truckin’ off smiling, but how would you handle my situation? A wedding is a time of happiness, excitement, beautiful brides and handsome grooms; not sadness. Both of these brides, Erica and Ashlee were and truly are beautiful, and the grooms, Adam and Dan, are certainly handsome young men. As I sat in the audience prior to taking part in my nephew’s wedding ceremony, I could not help but think back over the years. Nearly forty-six years after my brother’s passing, I see his children, his grandchildren and great-grandchildren, and other relatives. I think if he were only here to enjoy the happiness of the day. He should be the one sitting next to his wife and taking his role in the marriage of his grandson. Or thinking of my good friend and his granddaughter; thirty-two years ago my wife and I sat in a church in Basking Ridge, New Jersey. I watched as my friend walked his daughter down an aisle and gave her hand in marriage. Now the bride’s father stood in front of me giving his daughter in marriage. And as I began my part of the ceremony I thought how Ashlee’s grandfather should have been standing where I stood. There are some things that happen in life that don’t turn out the way they should have. I found myself in two places within a week’s time, two places that should have been reserved for others. Sometimes in life we are called on to do things that someone else should have had the privilege to do. That thought makes me sad; but you cannot stay sad at a wedding. Neither of those two grandfathers’ would have wanted that, so you move on and rejoice in the happiness of the day. 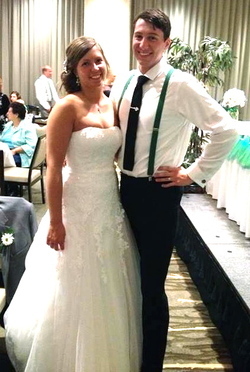 Blessings and good wishes to Adam and Erica and Dan and Ashlee. You know sometimes just showing up, one’s mere presence, can be of benefit to another. The following is something I wrote a couple years back. It’s about an unusual experience I had while attending an Easter Sunday church service. I did absolutely nothing but evidently I did something. I could not believe what that lady said to me Sunday morning in church. Especially, as I didn’t even know her. What could I have done for her to say those words to me? On this morning we were running a bit late for church. Of all mornings, Easter morning. We had gone about a mile from our house when my wife said, “Oh, I forgot to put the ham in the oven.” After church all the family was to come to our house for dinner and Easter celebrations. You know the routine; hide eggs, kids eat too many chocolate bunnies and a big Sunday dinner. So we turned around and headed back to our house, put the ham in the oven and off again. When we got to church the usher walked us all the way to the front. I mean the front row. There were probably 1,000 plus folks in this auditorium and yes sir we got front row seats. Hey, this isn’t Elvis, this is church. We were close enough we could reach out and touch the Rev. I asked her to sit down with me and we talked further. As we prepared to leave I thanked her for her kind words, in fact we hugged one another and I told her again what a pleasure it was meeting her, I hoped we would do so again soon. Isn’t it interesting how sometimes we find ourselves wanting to do something to help another person. We think we need to say something or do something but we feel helpless. Here today all I did was show up and sit on the front row. We never know what our presence might do for another…think on that…and look for those “front row” opportunities in your life. Maybe there was a reason my wife forgot to put the ham in the oven, making us just late enough to be ushered to the front row. Maybe, just maybe. I like Willie Nelson. Sometimes I feel like ole Willie picks out a song just for me. Last week I went back home to southwestern Indiana, went back for my 50th high school class reunion, class of 1960. My hometown is just a speck, like a flea, about 9 miles south of Terre Haute, Indiana. I went to a very small high school in a very rural setting. We had twenty-seven in our class, and I think twenty-one or twenty-two of us went through all twelve grades together. The school is no longer in existence; the building is falling down and should be put out of its misery. I drove by my old house in the little village or what once had been a village area. Driving back to my home in Franklin, Tennessee this morning, I slipped in a Willie Nelson cd and the song that came on is one I very much identified with. To a little house on the other side of town. I used to play there in that yard. A lot of things were cheap and square and strange. It was one we loved believin’ in. a place worth livin in. a house where there was always love. I just drove by to see if things had changed. Oh, I just drove by to see if things had changed. Yes, a lot of things have changed, but some feelings about places and people from those times, no—-they never have, nor never will change.